Space debris, also known as orbital debris, space junk and space waste, is the collection of manmade defunct objects in orbit around Earth. This includes spent rocket stages, old satellites and fragments from disintegration, erosion and collisions. Since orbits overlap with new spacecraft, debris may collide with operational spacecraft. As of 2009 about 19,000 pieces of debris larger than 5 cm (2 in) are tracked, while an estimated 300,000 pieces larger than 1 cm exist below 2,000 kilometres (1,200 mi). For comparison, the International Space Station orbits in the 300–400 kilometres (190–250 mi) range and the 2009 satellite collision and 2007 antisat test events occurred at from 800 to 900 kilometres (500 to 560 mi). Most space debris is smaller than 1 cm (0.4 in), including dust from solid rocket motors, surface-degradation products (such as paint flakes) and frozen coolant droplets released from RORSAT nuclear-powered satellites. Impacts by these particles cause erosive damage, similar to sandblasting, which can be reduced by the addition of ballistic shielding (such as a Whipple shield, used to protect parts of the International Space Station) to a spacecraft. Not all parts of a spacecraft can be protected in this manner; solar panels and optical devices such as telescopes or star trackers are subject to constant wear from debris and micrometeoroids. Below 2,000 kilometres (1,200 mi), the flux from space debris is greater than that from meteoroids. Decreasing risk from space debris larger than 10 cm (4 in) is often obtained by maneuvering a spacecraft to avoid a collision. If a collision occurs, the resulting fragments can become an additional collision risk. Since the chance of collision is influenced by the number of objects in space, there is a critical density where the creation of new debris is theorized to occur faster than natural forces remove them. Beyond this point a runaway chain reaction (known as the Kessler syndrome) may occur, rapidly increasing the amount of debris in orbit and the risk to operational satellites. Whether the critical density has been reached in certain orbital bands is a subject of debate. A Kessler syndrome would render a portion of useful polar-orbiting bands difficult to use, increasing the cost of space missions. The measurement, growth mitigation and potential removal of space debris are conducted by the space industry. Most space debris consists of objects 1 cm (0.39 in) or smaller. The mid-2009 update to the NASA debris FAQ places the number of large debris items over 10 cm (3.9 in) at 19,000, from one to ten cm at about 500,000 and debris items smaller than 1 cm (0.39 in) in the tens of millions. Almost all debris weight is concentrated in larger objects; in 2002 about 1,500 objects, each weighing more than 100 kg (220 lb), accounted for over 98 percent of the 1,900 tons of debris then known in low Earth orbit. Since space debris is generated by man-made objects, the total possible mass of debris is the total mass of all spacecraft and rocket bodies which have reached orbit. The actual mass is less, since the orbits of some objects have decayed. The debris mass, dominated by larger objects (most of which have been detected), has remained relatively constant despite the addition of many smaller objects. Using a 2008 figure of 8,500 known debris items, their total mass is estimated at 5,500 t (12,100,000 lb). Every satellite, space probe and manned mission can potentially leave space debris. Any impact between two objects of sizable mass can generate spall from the collision. Each piece of spall can cause further damage, creating more space debris. With a large-enough collision (between a space station and a defunct satellite, for example), the amount of debris could make low Earth orbit impossible. In LEO there are few "universal orbits" which keep spacecraft in particular rings (in contrast to GEO, a single widely used orbit). The closest are the sun-synchronous orbits that maintain a constant angle between the Sun and the orbital plane. LEO satellites provide global coverage in many orbital planes, and the 15 orbits per day typical of LEO satellites result in frequent approaches between objects. Since Sun-synchronous orbits are polar, the polar regions are common crossing points. In the presence of space debris, orbital perturbations change the orbital plane's direction over time and collisions can occur from any direction. Collisions usually occur at high speed, typically several kilometres per second. Such a collision will normally create large numbers of objects in the critical size range, as in the 2009 satellite collision. For this reason, the Kessler syndrome generally applies only to the LEO region; a collision creates debris crossing other orbits, leading to a cascade effect. At the most commonly used low Earth orbits for manned missions, 400 km (250 mi) and below, air drag helps keep the zones clear. Collisions below this altitude are less of an issue, since their fragment orbits have a perigee at (or below) this altitude. The critical altitude also changes as a result of space weather, which expands and contracts the upper atmosphere. An expansion of the atmosphere leads to increased drag on the fragments and a shorter orbit lifetime; during the 1990s, an expanded atmosphere was a factor in reduced orbital-debris density. Another factor was fewer launches by Russia, who made the vast majority of launches in the 1970s and 1980s. At higher altitudes, where atmospheric drag is less significant, orbital decay takes longer. Slight atmospheric drag, lunar perturbations and solar radiation pressure can gradually bring debris down to lower altitudes (where it decays), but at very high altitudes this may take millennia. Although high-altitude orbits are less commonly used than LEO and the onset of the problem is slower, the numbers progress toward the critical threshold more quickly. The problem is especially significant in geostationary orbits (GEO), where satellites cluster over their primary ground targets and share the same orbital path. Orbital perturbations are a factor in a GEO, causing longitude drift of the spacecraft and precession of the orbital plane if uncorrected. Active satellites maintain their position with thrusters, but inoperable ones (such as Telstar 401) are collision hazards. Close approaches (within 50 meters) are estimated at one per year. Although velocities in GEO are low among geostationary objects, when a satellite becomes derelict it assumes a geosynchronous orbit; its orbital inclination increases about .8° and its speed increases about 100 miles per hour (160 km/h) per year. Impact velocity peaks at about 1.5 km/s (0.93 mi/s), and the debris field poses less short-term risk than a LEO collision, but a satellite would almost certainly be knocked out of operation. Large objects, such as solar-power satellites, are especially vulnerable to collisions. Although the ITU has strengthened its station-keeping requirements for new satellites, demanding that an owner guarantee their ability to safely move a satellite out of its orbital slot at the end of its lifespan, studies suggest that existing ITU requirements are insufficient to affect collision frequency. Since GEO orbit is too distant to accurately measure the debris field of objects under 1 m (3 ft 3 in), the nature of the problem is not well known. It has been suggested that satellites be moved to empty spots in GEO, which would require less maneuvering and make it easier to predict future motion. Satellites in other orbits, especially satellites or boosters stranded in geostationary transfer orbit, are an additional concern due to their typically high crossing velocity. Despite efforts to reduce risk, spacecraft collisions have occurred. The European Space Agency telecommunications satellite Olympus-1 was struck by a meteoroid on 11 August 1993 and eventually moved to a graveyard orbit. On 24 July 1996 Cerise, a French microsatellite in a Sun-synchronous LEO, was hit by fragments of an Ariane-1 H-10 upper-stage booster which had exploded in November 1986. On 29 March 2006, the Russian Express-AM11 communications satellite was struck by an unknown object and rendered inoperable; its engineers had enough contact time with the satellite to send it into a graveyard orbit. 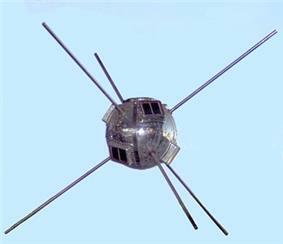 In 1958, the United States launched Vanguard I into a medium Earth orbit (MEO). as of October 2009, it is the oldest surviving piece of man-made space debris still in orbit. In a catalog of known launches until July 2009, the Union of Concerned Scientists listed 902 operational satellites from a known population of 19,000 large objects and about 30,000 objects launched. During the 1970s and 1980s, the Soviet Union launched a number of naval surveillance satellites as part of their RORSAT (Radar Ocean Reconnaissance SATellite) program. The satellites were equipped with a BES-5 nuclear reactor to power their radar systems. Although the satellites were normally boosted into a medium-altitude graveyard orbit, several failures resulted in radioactive material reaching the ground or water. Satellites which have been disposed of have an estimated eight-percent probability of puncture and coolant release over a 50-year period. The coolant freezes into droplets of solid sodium-potassium alloy, forming additional debris. These events continue to occur. For example, in February 2015, the USAF Defense Meteorological Satellite Program Flight 13 (DMSP-F13) exploded on orbit, creating at least 149 debris objects, which are expected to remain in orbit for decades. According to Edward Tufte's book Envisioning Information, space debris includes a glove lost by astronaut Ed White on the first American space-walk (EVA); a camera lost by Michael Collins near Gemini 10; garbage bags jettisoned by Soviet cosmonauts during Mir's 15-year life, a wrench and a toothbrush. Sunita Williams of STS-116 lost a camera during an EVA. During an STS-120 EVA to reinforce a torn solar panel a pair of pliers was lost, and in an STS-126 EVA Heidemarie Stefanyshyn-Piper lost a briefcase-sized tool bag. Lower stages, like the solid rocket boosters of the Space Shuttle or the Apollo program-era Saturn IB launch vehicles, do not reach orbital velocity. Upper stages, such as the Inertial Upper Stage, begin and end their productive lives in orbit. Boosters that remain on orbit are a debris problem; a major known impact event involved an Ariane booster. In characterizing the problem of space debris, it was learned that much debris was due to the breakup of unpassivated rocket upper stages. Although NASA and the United States Air Force improved the long-term survivability of their boosters with a requirement for upper-stage passivation, other launchers did not make similar changes. On 11 March 2000 a Chinese Long March 4 CBERS-1 upper stage exploded in orbit, creating a debris cloud. A Russian Briz-M booster stage exploded in orbit over South Australia on 19 February 2007. The booster, launched on 28 February 2006 carrying an Arabsat-4A communications satellite, malfunctioned before it could use up its propellant. Although the explosion was captured on film by astronomers, due to the orbit path the debris cloud has been difficult to measure with radar. By 21 February 2007, over 1,000 fragments were identified. A 14 February 2007 breakup was recorded by Celestrak. Eight breakups occurred in 2006, the most since 1993. Another Briz-M broke up on 16 October 2012 after a failed 6 August Proton-M launch. The amount and size of the debris was unknown. A past debris source was the testing of anti-satellite weapons (ASATs) by the U.S. and Soviet Union during the 1960s and 1970s. North American Aerospace Defense Command (NORAD) files only contained data for Soviet tests, and debris from U.S. tests were only identified later. By the time the debris problem was understood, widespread ASAT testing had ended; the U.S. Program 437 was shut down in 1975. The U.S. restarted their ASAT programs in the 1980s with the Vought ASM-135 ASAT. A 1985 test destroyed a 1-tonne (2,200 lb) satellite orbiting at 525 km (326 mi), creating thousands of pieces of space debris larger than 1 cm (0.39 in). Because the test was made at a relatively low altitude, atmospheric drag decayed the orbit of almost all large debris within a decade. A de facto moratorium followed the test. China was condemned for the military implications and the amount of debris from their 2007 anti-satellite missile test, the largest single space debris incident in history (estimated to have created more than 2,300 pieces of trackable debris—golf-ball size or larger—over 35,000 pieces 1 cm (0.4 in) or larger and one million pieces 1 mm (0.04 in) or larger). The target satellite orbited between 850 km (530 mi) and 882 km (548 mi), the portion of near-Earth space most densely populated with satellites. Since atmospheric drag is low at that altitude the debris is less likely to return to Earth, and in June 2007 NASA's Terra environmental spacecraft maneuvered to avoid impact from the debris. On 20 February 2008, the U.S. launched an SM-3 Missile from the USS Lake Erie to destroy a defective U.S. spy satellite thought to be carrying 450 kg (1,000 lb) of toxic hydrazine propellant. The event occurred at about 250 km (155 mi), and the resulting debris has a perigee of 250 km (155 mi) or lower. The missile was aimed to minimize the amount of debris, which (according to Pentagon Strategic Command chief Kevin Chilton) had decayed by early 2009. The vulnerability of satellites to collisions with larger debris and the possibility of an attack on LEO satellites has triggered speculation that such attacks are within the capabilities of countries unable to make a precision attack. An attack on a satellite of 10 tonnes or more would heavily damage the LEO environment. 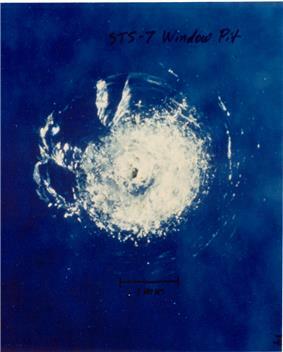 A micrometeoroid left this crater on the surface of Space Shuttle Challenger's front window on STS-7. Spacecraft in a debris field are subject to wear as a result of impacts. Although critical areas are normally protected by Whipple shields, eliminating most damage, low-mass impacts affect the life of a space mission if the craft is powered by solar panels. These panels are difficult to protect since their face must be directly exposed to the Sun, and they are often punctured by debris. When struck, solar panels produce a cloud of gas-sized particles which does not present as much of a risk as debris does to other spacecraft. The gas, generally a plasma when created, is an electrical risk to the panels themselves. 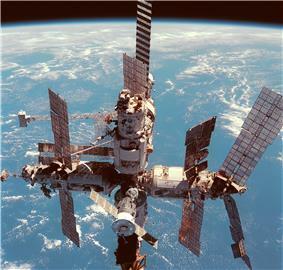 The effect of impacts with smaller debris was notable on Mir, the Soviet space station, since it remained in space for long periods with its original module panels. Impacts with larger debris usually destroy a spacecraft, and several known (or suspected) impact events have occurred. The earliest on record was the loss of Kosmos 1275, which disappeared on 24 July 1981 (a month after launch). Tracking indicated that it had broken up, creating 300 new objects. Kosmos, which contained no volatiles, is assumed to have collided with a small object but a battery explosion is another possible cause. Kosmos 1484 broke up in a similar manner on 18 October 1993. 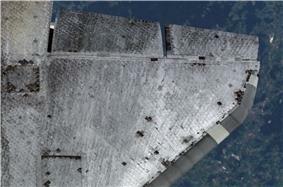 Debris impacts on Mir's solar panels degraded their performance. The damage is most noticeable on the panel on the right, which is facing the camera with a high degree of contrast. Extensive damage to the smaller panel below is due to impact with a Progress spacecraft. Several confirmed impact events have occurred since. Olympus-1 was struck by a meteoroid on 11 August 1993, and left adrift. On 24 July 1996, the French microsatellite Cerise was hit by fragments of an Ariane-1 H-10 upper-stage booster which exploded in November 1986. On 29 March 2006, the Russian Ekspress AM11 communications satellite was struck by an unknown object and rendered inoperable; its engineers had sufficient time in contact with the spacecraft to send it to a parking orbit out of GEO. The first major space-debris collision occurred on 10 February 2009 at 16:56 UTC. The deactivated 950 kg (2,090 lb) Kosmos 2251 and the operational 560 kg (1,230 lb) Iridium 33 collided, 500 mi (800 km) over northern Siberia. The relative speed of impact was about 11.7 km/s (7.3 mi/s), or about 42,120 km/h (26,170 mph). 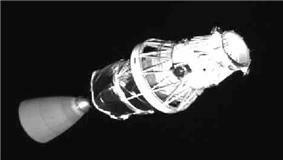 Both satellites were destroyed; the collision created a debris cloud, with accurate estimates of the number of pieces of debris unavailable. On 22 January 2013 BLITS (a Russian laser-ranging satellite) was struck by debris suspected to be from the 2007 Chinese anti-satellite missile test, changing its orbit and spin rate. In a Kessler syndrome, satellite lifetimes would be measured in years or months. New satellites could be launched through the debris field into higher orbits or placed in lower orbits (where decay removes the debris), but the utility of the region between 800 and 1,500 km (500 and 930 mi) is the reason for its amount of debris. Since the early Space Shuttle missions, NASA has used the NORAD database to monitor the Shuttle's orbital path for debris. During the 1980s, this used a substantial amount of the NORAD tracking system's capacity. The first Space Shuttle collision-avoidance maneuver occurred during STS-48 in September 1991, in which a seven-second reaction control system burn was performed to avoid debris from Kosmos 955. Similar manoeuvres followed on missions 53, 72 and 82. One of the first events to publicize the debris problem occurred on Challenger's second flight, STS-7. A fleck of paint struck its front window, creating a pit over 1 mm (0.04 in) wide. Endeavour experienced a similar impact on STS-59 in 1994, pitting the window about half its depth. Post-flight examinations indicate an increase in the number of minor debris impacts since 1998. Damage from smaller debris has become a significant problem, with window chipping and minor damage to thermal protection system tiles (TPS) common by the 1990s. To mitigate its impact, when the Shuttle reached orbit it was flown tail-first to take as much of the debris load as possible on the engines and rear cargo bay (not used in orbit or during descent, and less critical for post-launch operation). When flying to the International Space Station, the Shuttle was placed where the station provided as much protection as possible. Endeavour had a major impact on its radiator during STS-118. The entry hole is about 1⁄4 inch, and the exit hole is twice as large. The increase in debris led to a re-evaluation of the issue, with a catastrophic impact with large debris considered the primary threat to Shuttle operations on every mission. Mission planning required a thorough examination of debris risk, with an executive-level decision to proceed required if the risk of catastrophic impact is greater than 1 in 200. On a normal (low-orbit) mission to the ISS the estimated risk was 1 in 300, but the STS-125 mission to repair the Hubble Space Telescope at 350 mi (560 km) was initially calculated at a 1-in-185 risk (due to the 2009 satellite collision). A re-analysis with better debris numbers reduced the estimated risk to 1 in 221, and the mission was allowed to proceed. Two serious debris incidents have occurred on recent Shuttle missions. In 2006, Atlantis was struck by a fragment of circuit board during STS-115 which bored a small hole through the radiator panels in the cargo bay. 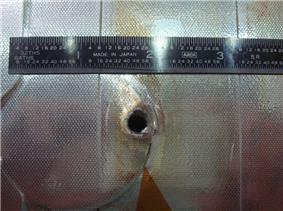 A similar incident occurred on STS-118 in 2007, when debris blew a bullet-like hole through Endeavour's radiator panel. Although the International Space Station (ISS) uses Whipple shielding to protect itself from minor debris, portions (notably its solar panels) cannot be protected. In 1989 the ISS panels were predicted to experience about 0.23 percent degradation in four years, and they were overdesigned by one percent. The primary protection for the ISS against larger debris, as for the Shuttle, is avoidance. A maneuver order is issued if ground controllers estimate that "there is a greater than one-in-10,000 chance of a debris strike." As of January 2014, there have been sixteen debris-maneuver firings in the fifteen years the ISS has been in orbit. The crew were directed on three occasions to abandon work and take refuge in the Soyuz capsule due to late debris-proximity warnings. In addition to the sixteen firings and three Soyuz-capsule shelter orders, one attempted maneuver failed. A March 2009 close call involved debris believed to be a 10 cm (3.9 in) piece of the Kosmos 1275 satellite. In 2013 the ISS did not need to maneuver to avoid space debris, after a record four debris-related maneuver firings the previous year. In a Kessler syndrome, the threat to manned missions may be too great for low Earth orbit operations. Although most manned space activity takes place at altitudes below 800 to 1,500 km (500 to 930 mi), a cascade in that region would rain down into lower altitudes and the decay time scale is such that "the resulting debris environment is likely to be too hostile for future space use." Although most debris burns up in the atmosphere, larger objects can reach the ground intact. According to NASA, an average of one cataloged piece of debris has fallen back to Earth each day for the past 50 years. Despite their size, there has been no significant property damage from the debris. In 1969 five sailors on a Japanese ship were injured by space debris. In 1997 an Oklahoma woman, Lottie Williams, was uninjured when she was hit in the shoulder by a 10 cm × 13 cm (3.9 in × 5.1 in) piece of blackened, woven metallic material confirmed as part of the propellant tank of a Delta II rocket which launched a U.S. Air Force satellite the year before. The original re-entry plan for Skylab called for the station to remain in space for eight to ten years after its final mission in February 1974. High solar activity expanded the upper atmosphere, resulting in higher-than-expected drag and bringing its orbit closer to Earth than planned. On 11 July 1979 Skylab re-entered the Earth's atmosphere and disintegrated, raining debris along a path over the southern Indian Ocean and Western Australia. 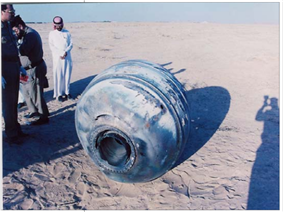 On 12 January 2001, a Star 48 Payload Assist Module (PAM-D) rocket upper stage re-entered the atmosphere after a "catastrophic orbital decay", crashing in the Saudi Arabian desert. It was identified as the upper-stage rocket for NAVSTAR 32, a GPS satellite launched in 1993. In the 2003 Columbia disaster, large parts of the spacecraft reached the ground and entire equipment systems remained intact. NASA has warned the public to avoid contact with the debris because of the possible presence of hazardous chemicals. On 27 March 2007, airborne debris from a Russian spy satellite was seen by the pilot of a LAN Airlines Airbus A340 carrying 270 passengers whilst flying over the Pacific Ocean between Santiago and Auckland. The pilot estimated that the debris was within 8 kilometres (5.0 mi) of the aircraft, and he heard a sonic boom as it passed. Radar and optical detectors such as lidar are the main tools for tracking space debris, and determining orbits to allow re-acquisition is difficult. Although objects smaller than 10 cm (4 in) have a small cross-section and reduced orbital stability, debris as small as 1 cm (0.4 in) can be tracked. The NASA Orbital Debris Observatory tracked space debris with a 3 m (10 ft) liquid mirror transit telescope. Radio waves are transmitted into space, bouncing off space debris and back to a tracking receiver. This method of tracking may be a useful early-warning system on spacecraft. The U.S. Strategic Command catalogs known orbital objects, originally to prevent misidentification as hostile missiles. The 2009 edition listed about 19,000 objects. Observation data from ground-based radar facilities and telescopes and a space-based telescope are used to update the catalog. Most debris remains unobserved; according to the ESA Meteoroid and Space Debris Terrestrial Environment Reference 2005 (MASTER-2005), there are more than 600,000 objects larger than 1 cm (0.4 in) in orbit. Other sources of information on space debris include measurements by the ESA Space Debris Telescope, TIRA, the Goldstone, Haystack, and EISCAT radars and the Cobra Dane phased array radar. The data gathered are used to update debris-environment models such as ESA-MASTER, the only means of assessing the impact risk of space debris. The Long Duration Exposure Facility (LDEF) is an important source of information on small-particle space debris. Returned space-debris hardware is a valuable source of information on the (sub-millimetre) space-debris environment. The LDEF satellite deployed by STS-41-C Challenger and retrieved by STS-32 Columbia spent 68 months in orbit. The examination of its surface permitted analysis of the directional distribution and composition of the debris flux. The EURECA satellite, deployed by STS-46 Atlantis in 1992 and retrieved by STS-57 Endeavour in 1993, was also used for debris study. The solar arrays of the Hubble Space Telescope returned during missions STS-61 Endeavour and STS-109 Columbia are an important source of information on the debris environment, with impact craters counted and classified by the ESA to validate debris-environment models. Similar materials returned from Mir were extensively studied, notably the Mir Environmental Effects Payload (which studied the environment of the Mir area). Space debris groups resulting from satellite breakups are studied with scatter plots known as Gabbard diagrams. 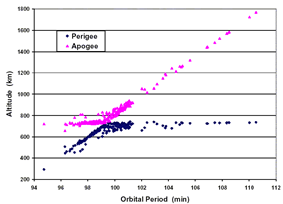 In a Gabbard diagram, the perigee and apogee of debris fragments resulting from a collision are plotted with respect to the orbital period of each fragment. Their distribution may indicate the direction and point of impact. Manmade space debris has been dropping out of orbit at an average rate of about one object per day for the past 50 years. Variation in the average rate occurs as a result of the 11-year solar cycle, averaging almost three objects per day at solar maximum due to the heating (and thereby expansion) of the Earth's atmosphere. At solar minimum, usually five and one-half years later, the average is one about every three days. In addition to atmospheric effects on the natural decay of space debris, corporations, academics and government agencies have proposed plans and technology to deal with space debris. As of November 2014, most of the technological approaches have not become funded projects and there is no business plan extant to reduce the amount of space debris. In addition to technological approaches, a number of scholars have observed that institutional factors—political, legal, economic and cultural "rules of the game"—are the greatest impediment to the cleanup of near-Earth space. There is no commercial incentive to reduce space debris, since its cost is not assigned to the entity producing it, but a number of suggestions have been made. A number of national and international factors affect the production and life of space debris. There have been limited effects to date. In the United States, governmental bodies have been charged with backsliding on previous commitments to limit debris growth, "let alone tackling the more complex issues of removing orbital debris." To reduce future space debris, the passivation of spent upper stages by the release of residual propellants aims to reduce the risk of orbital explosions generating additional debris. The modification of the Delta boosters eliminated their further contribution to the problem. Although there is no international treaty minimizing space debris, the ISO began preparing a standard for space-debris mitigation. Germany and France have posted bonds to safeguard property from debris damage. One of the largest proposed satellite constellations to date—the OneWeb constellation with approximately 700 satellites on orbit after 2018—has explicitly stated that their satellites will be designed to comply with standard "orbital debris-mitigation guidelines for removing satellites from orbit and, for low-orbit satellites, assuring that they reenter the Earth’s atmosphere within 25 years of retirement." The company has no plans for extraordinary measures beyond the standard "25-years" guideline, even though this one constellation alone will increase the number of active satellites on orbit by 25 percent. With a "one-up, one-down" launch-license policy for Earth orbits, launch-vehicle operators would pay for debris mitigation and rendezvous with, capture and de-orbit a derelict satellite from approximately the same orbital plane. Another possibility is the robotic refueling of satellites. Although the ITU requires geostationary satellites to move to a graveyard orbit at the end of their lives, the selected orbital areas do not sufficiently protect GEO lanes from debris. Rocket stages (or satellites) with enough propellant may power themselves into a decaying orbit. If a direct, controlled de-orbit would require too much propellant, a satellite may be brought to an orbit where atmospheric drag would cause it to eventually de-orbit. This was done with the French Spot-1 satellite, reducing its atmospheric re-entry time from a projected 200 years to about 15 by lowering its perigee from 830 km (516 mi) to about 550 km (342 mi). Passive methods of increasing the orbital decay rate of spacecraft debris have been proposed. Instead of rockets, an electrodynamic tether could be attached to a spacecraft at launch; at the end of its lifetime, the tether would be rolled out to slow the spacecraft. Tethers up to 30 kilometres (19 mi) have been successfully deployed in orbit. Other proposals include a booster stage with a sail-like attachment and a large, thin, inflatable balloon envelope. A well-studied solution uses a remotely controlled vehicle to rendezvous with, capture and return debris to a central station. One such system is Space Infrastructure Servicing, a commercially developed refueling depot and service spacecraft for communications satellites in geosynchronous orbit originally scheduled for a 2015 launch. The SIS would be able to "push dead satellites into graveyard orbits." The Advanced Common Evolved Stage family of upper stages is being designed with a high leftover-propellant margin (for derelict capture and de-orbit) and in-space refueling capability for the high Delta-v required to de-orbit heavy objects from geosynchronous orbit. A tug-like satellite to drag debris to a safe altitude for it to burn up in the atmosphere has been researched. When debris is identified the satellite creates a difference in potential between the debris and itself, then using its thrusters to move itself and the debris to a safer orbit. A variation of this approach is for the remotely controlled vehicle to rendezvous with debris, capture it temporarily to attach a smaller de-orbit satellite and drag the debris with a tether to the desired location. The "mothership" would then tow the debris-smallsat combination for atmospheric entry or move it to a graveyard orbit. One such system is the proposed Busek ORbital DEbris Remover (ORDER), which would carry over 40 SUL (Satellite on Umbilical Line) de-orbit satellites and propellant sufficient for their removal. The laser broom uses a ground-based laser to ablate the front of the debris, producing a rocket-like thrust which slows the object. With continued application, the debris would fall enough to be influenced by atmospheric drag. During the late 1990s, the U.S. Air Force's Project Orion was a laser-broom design. 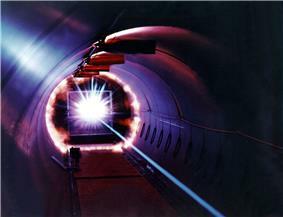 Although a test-bed device was scheduled to launch on a Space Shuttle in 2003, international agreements banning powerful laser testing in orbit limited its use to measurements. The Space Shuttle Columbia disaster postponed the project and according to Nicholas Johnson, chief scientist and program manager for NASA's Orbital Debris Program Office, "There are lots of little gotchas in the Orion final report. There's a reason why it's been sitting on the shelf for more than a decade." The momentum of the laser-beam photons could directly impart a thrust on the debris sufficient to move small debris into new orbits out of the way of working satellites. NASA research in 2011 indicates that firing a laser beam at a piece of space junk could impart an impulse of 1 mm (0.039 in) per second, and keeping the laser on the debris for a few hours per day could alter its course by 200 m (660 ft) per day. One drawback is the potential for material degradation; the energy may break up the debris, adding to the problem. A similar proposal places the laser on a satellite in Sun-synchronous orbit, using a pulsed beam to push satellites into lower orbits to accelerate their reentry. A proposal to replace the laser with an Ion Beam Shepherd has been made, and other proposals use a foamy ball of aerogel or a spray of water, inflatable balloons, electrodynamic tethers, boom electroadhesion, and dedicated anti-satellite weapons. On 7 January 2010 Star, Inc. reported that it received a contract from the Space and Naval Warfare Systems Command for a feasibility study of the ElectroDynamic Debris Eliminator (EDDE) propellantless spacecraft for space-debris removal. In February 2012 the Swiss Space Center at École Polytechnique Fédérale de Lausanne announced the Clean Space One project, a nanosatellite demonstration project for matching orbit with a defunct Swiss nanosatellite, capturing it and de-orbiting together. As of 2006 the cost of any of these solutions is about the same as launching a spacecraft and, according to NASA's Nicholas Johnson, not cost-effective. Since then Space Sweeper with Sling-Sat (4S), a grappling satellite which captures and ejects debris, has been studied. A consensus of speakers at a meeting in Brussels on 30 October 2012 organized by the Secure World Foundation (a U.S. think tank) and the French International Relations Institute reported that removal of the largest debris would be required to prevent the risk to spacecraft becoming unacceptable in the foreseeable future (without any addition to the inventory of dead spacecraft in LEO). Removal costs and legal questions about ownership and the authority to remove defunct satellites have stymied national or international action. Current space law retains ownership of all satellites with their original operators, even debris or spacecraft which are defunct or threaten active missions. On 28 February 2014, Japan's JAXA program launched a test "space net" satellite. The launch was an operational test only. Since 2012, the European Space Agency has designed a mission to remove large space debris from orbit. The mission, e.Deorbit, is scheduled for launch by 2021 with an objective to remove debris heavier than 4,000 kilograms (8,800 lb) from LEO. Several capture techniques are being studied, including a net, a harpoon and a combination robot arm and clamping mechanism. In 1946 during the Giacobinid meteor shower, Helmut Landsberg collected several small magnetic particles that were apparently associated with the shower. Fred Whipple was intrigued by this and wrote a paper that demonstrated that particles of this size were too small to maintain their velocity when they encountered the upper atmosphere. Instead, they quickly decelerated and then fell to Earth unmelted. In order to classify these sorts of objects, he coined the term "micro-meteorite". 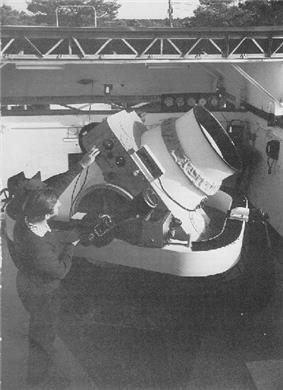 Whipple, in collaboration with Fletcher Watson of the Harvard Observatory, led an effort to build an observatory to directly measure the velocity of the meteors that could be seen. At the time the source of the micro-meteorites was not known. Direct measurements at the new observatory were used to locate the source of the meteors, demonstrating that the bulk of material was left over from comet tails, and that none of it could be shown to have an extra-solar origin. Today it is understood that meteoroids of all sorts are leftover material from the formation of the Solar System, consisting of particles from the interplanetary dust cloud or other objects made up from this material, like comets. The early studies were based on optical measurements only. In 1957, Hans Pettersson conducted one of the first direct measurements of the fall of space dust on the Earth, estimating it to be 14,300,000 tons per year. This suggested that the meteoroid flux in space was much higher than the number based on telescope observations. Such a high flux presented a very serious risk to missions deeper in space, specifically the high-orbiting Apollo capsules. To determine whether the direct measurement was accurate, a number of additional studies followed, including the Pegasus satellite program. These showed that the rate of meteors passing into the atmosphere, or flux, was in line with the optical measurements, at around 10,000 to 20,000 tons per year. The "energy flash" of a hypervelocity impact during a simulation of what happens when a piece of orbital debris hits a spacecraft in orbit. Whipple's work pre-dated the space race and it proved useful when space exploration started only a few years later. His studies had demonstrated that the chance of being hit by a meteoroid large enough to destroy a spacecraft was extremely remote. However, a spacecraft would be almost constantly struck by micrometeorites, about the size of dust grains. Whipple had already developed a solution to this problem in 1946. Originally known as a "meteor bumper" and now termed the Whipple shield, this consists of a thin foil film held a short distance away from the spacecraft's body. When a micrometeoroid strikes the foil, it vaporizes into a plasma that quickly spreads. By the time this plasma crosses the gap between the shield and the spacecraft, it is so diffused that it is unable to penetrate the structural material below. The shield allows a spacecraft body to be built to just the thickness needed for structural integrity, while the foil adds little additional weight. Such a spacecraft is lighter than one with panels designed to stop the meteoroids directly. For spacecraft that spend the majority of their time in orbit, some variety of the Whipple shield has been almost universal for decades. Later research showed that ceramic fibre woven shields offer better protection to hypervelocity (~7 km/s) particles than aluminium shields of equal weight. Another modern design uses multi-layer flexible fabric, as in NASA's design for its never-flown TransHab expandable space habitation module, and the Bigelow Expandable Activity Module, which is currently finishing ground testing and is scheduled to be launched in 2015 to attach to the ISS for two years of orbital testing. As space missions moved out from the Earth and into deep space, the question arose about the dangers posed by the asteroid belt environment, which probes would have to pass through on voyages to the outer solar system. Although Whipple had demonstrated that the near-Earth environment was not a problem for space travel, the same depth of analysis had not been applied to the belt. Starting in late 1968, Donald Kessler published a series of papers estimating the spatial density of asteroids. The main outcome of this work was the demonstration that risks in transiting the asteroid belt could be mitigated, and the maximum possible flux was about the same as the flux in near-Earth space. A few years later, the Pioneer and Voyager missions demonstrated this to be true by successfully transiting this region. The evolution of the asteroid belt had been studied as a dynamic process since it was first considered by Ernst Öpik. Öpik's seminal paper considered the effect of gravitational influence of the planets on smaller objects, notably the Mars-crossing asteroids, noting that their expected lifetime was on the order of billions of years. A number of papers explored this work further, using elliptical orbits for all the objects and introducing a number of mathematical refinements. Kessler used these methods to study Jupiter's moons, calculating expected lifetimes on the order of billions of years and demonstrating that several of the outer moons were almost certainly the result of recent collisions. When the launch of Sputnik in 1957 began the Space Race, the North American Aerospace Defense Command (NORAD) began compiling a database (the Space Object Catalog of all known rocket launches and objects reaching orbit: satellites, protective shields and upper- and lower-stage booster rockets. NASA published modified versions of the database in two-line element set, and during the early 1980s the CelesTrak bulletin board system re-published them. The trackers who fed the database were aware of other objects in orbit, many of which were the result of in-orbit explosions. Some were deliberately caused during 1960s anti-satellite weapon (ASAT) testing, and others were the result of rocket stages blowing up in orbit as leftover propellant expanded and ruptured their tanks. To improve tracking, NORAD employee John Gabbard kept a separate database. Studying the explosions, Gabbard developed a technique for predicting the orbital paths of their products, and Gabbard diagrams (or plots) are now widely used. These studies were used to improve the modelling of orbital evolution and decay. When the NORAD database became publicly available during the 1970s, NASA scientist Donald J. Kessler applied the technique developed for the asteroid-belt study to the database of known objects. In 1978 Kessler and Burton Cour-Palais co-authored "Collision Frequency of Artificial Satellites: The Creation of a Debris Belt", demonstrating that the process controlling asteroid evolution would cause a similar collision process in LEO in decades rather than billions of years. They concluded that by about 2000, space debris would outpace micrometeoroids as the primary ablative risk to orbiting spacecraft. At the time, it was widely thought that drag from the upper atmosphere would de-orbit debris faster than it was created. However, Gabbard was aware that the number and type of objects in space were under-represented in the NORAD data and was familiar with its behaviour. In an interview shortly after the publication of Kessler's paper, Gabbard coined the term "Kessler syndrome" to refer to the accumulation of debris; it became widely used after its appearance in a 1982 Popular Science article, which won the Aviation-Space Writers Association 1982 National Journalism Award. Baker-Nunn cameras were widely used to study of space debris. The lack of hard data about space debris prompted a series of studies to better characterize the LEO environment. In October 1979, NASA provided Kessler with funding for further studies. Several approaches were used by these studies. Optical telescopes or short-wavelength radar was used to measure the number and size of space objects, and these measurements demonstrated that the published population count was at least 50% too low. Before this, it was believed that the NORAD database accounted for the majority of large objects in orbit. Some objects (typically, U.S. military spacecraft) were found to be omitted from the NORAD list, and others were not included because they were considered unimportant. The list could not easily account for objects under 20 cm (7.9 in) in size—in particular, debris from exploding rocket stages and several 1960s anti-satellite tests. Returned spacecraft were microscopically examined for small impacts, and sections of Skylab and the Apollo Command/Service Module which were recovered were found to be pitted. Each study indicated that the debris flux was higher than expected and debris was the primary source of collisions in space. LEO already demonstrated the Kessler syndrome. In 1981 Kessler found that 42 percent of cataloged debris was the result of 19 events, primarily explosions of spent rocket stages (especially U.S. Delta rockets). He discovered this by using Gabbard's methods against known debris fields, overturning the previously held belief that most unknown debris was from old ASAT tests. A number of other Delta components in orbit (Delta was a workhorse of the U.S. space program) had not yet exploded. During the 1980s, the U.S. Air Force conducted an experimental program to determine what would happen if debris collided with satellites or other debris. The study demonstrated that the process differed from micrometeoroid collisions, with large chunks of debris created which would become collision threats. A 1-kg object impacting at 10 km/s, for example, is probably capable of catastrophically breaking up a 1,000-kg spacecraft if it strikes a high-density element in the spacecraft. In such a breakup, numerous fragments larger than 1 kg would be created. Kessler's analysis divided the problem into three parts. With a low-enough density, the addition of debris by impacts is slower than their decay rate and the problem is not significant. Beyond that is a critical density, where additional debris leads to additional collisions. At densities beyond this critical mass production exceeds decay, leading to a cascading chain reaction reducing the orbiting population to small objects (several cm in size) and increasing the hazard of space activity. This chain reaction is known as the Kessler syndrome. Aggressive space activities without adequate safeguards could significantly shorten the time between collisions and produce an intolerable hazard to future spacecraft. Some of the most environmentally dangerous activities in space include large constellations such as those initially proposed by the Strategic Defense Initiative in the mid-1980s, large structures such as those considered in the late-1970s for building solar power stations in Earth orbit, and anti-satellite warfare using systems tested by the USSR, the U.S., and China over the past 30 years. Such aggressive activities could set up a situation where a single satellite failure could lead to cascading failures of many satellites in a period much shorter than years. During the 1980s, NASA and other U.S. groups attempted to limit the growth of debris. One effective solution was implemented by McDonnell Douglas on the Delta booster, by having the booster move away from its payload and vent any propellant remaining in its tanks. This eliminated the pressure buildup in the tanks which caused them to explode in the past. Other countries were slower to adopt this measure and, due especially to a number of launches by the Soviet Union, the problem grew throughout the decade. A new battery of studies followed as NASA, NORAD and others attempted to better understand the orbital environment, with each adjusting the number of pieces of debris in the critical-mass zone upward. Although in 1981 (when Schefter's article was published) the number of objects was estimated at 5,000, new detectors in the Ground-based Electro-Optical Deep Space Surveillance system found new objects. By the late 1990s, it was thought that most of the 28,000 launched objects had already decayed and about 8,500 remained in orbit. By 2005 this was adjusted upward to 13,000 objects, and a 2006 study increased the number to 19,000 as a result of an ASAT test and a satellite collision. In 2011, NASA said that 22,000 objects were being tracked. The growth in the number of objects as a result of the late-1990s studies sparked debate in the space community on the nature of the problem and the earlier dire warnings. According to Kessler's 1991 derivation and 2001 updates, the LEO environment in the 1,000 km (620 mi) altitude range should be cascading. 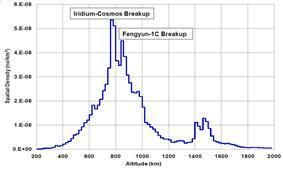 However, only one major incident has occurred: the 2009 satellite collision between Iridium 33 and Cosmos 2251. The lack of obvious short-term cascading has led to speculation that the original estimates overstated the problem. According to Kessler a cascade would not be obvious until it was well advanced, which might take years. A 2006 NASA model suggested that if no new launches took place the environment would retain the then-known population until about 2055, when it would increase on its own. Richard Crowther of Britain's Defence Evaluation and Research Agency said in 2002 that he believed the cascade would begin about 2015. The National Academy of Sciences, summarizing the professional view, noted widespread agreement that two bands of LEO space—900 to 1,000 km (620 mi) and 1,500 km (930 mi)—were already past critical density. In the 2009 European Air and Space Conference, University of Southampton researcher Hugh Lewis predicted that the threat from space debris would rise 50 percent in the next decade and quadruple in the next 50 years. As of 2009, more than 13,000 close calls were tracked weekly. A 2011 report by the U.S. National Research Council warned NASA that the amount of orbiting space debris was at a critical level. According to some computer models, the amount of space debris "has reached a tipping point, with enough currently in orbit to continually collide and create even more debris, raising the risk of spacecraft failures". The report called for international regulations limiting debris and research of disposal methods. ^ Lisa Grossman, "NASA Considers Shooting Space Junk With Lasers", wired, 15 March 2011. ^ a b "Technical report on space debris", United Nations, New York, 1999. ^ Joseph Carroll, "Space Transport Development Using Orbital Debris", NASA Institute for Advanced Concepts, 2 December 2002, p. 3. ^ Robin McKie and Michael Day, "Warning of catastrophe from mass of 'space junk'" The Observer, 24 February 2008. ^ Matt Ford, "Orbiting space junk heightens risk of satellite catastrophes." Ars Technica, 27 February 2009. ^ "What are hypervelocity impacts?" ESA, 19 February 2009. ^ a b Kessler 1991, p. 65. ^ Kessler 1991, p. 268. ^ "Optical observation of space debris in high-altitude orbits". Retrieved 25 January 2015. ^ "Colocation Strategy and Collision Avoidance for the Geostationary Satellites at 19 Degrees West." CNES Symposium on Space Dynamics, 6–10 November 1989. ^ J. C. van der Ha and M. Hechler, "The Collision Probability of Geostationary Satellites" 32nd International Astronautical Congress, 1981, p. 23. ^ Orbital Debris, p. 86. ^ Orbital Debris, p. 152. ^ a b c d Klinkrad, p. 2. ^ a b "Notification for Express-AM11 satellite users in connection with the spacecraft failure" Russian Satellite Communications Company, 19 April 2006. ^ "Vanguard I celebrates 50 years in space". Eurekalert.org. Retrieved 2013-10-04. ^ a b Julian Smith, "Space Junk" USA Weekend, 26 August 2007. ^ "UCS Satellite Database" Union of Concerned Scientists, 16 July 2009. ^ C. Wiedemann et al, "Size distribution of NaK droplets for MASTER-2009", Proceedings of the 5th European Conference on Space Debris, 30 March-2 April 2009, (ESA SP-672, July 2009). ^ A. Rossi et al, "Effects of the RORSAT NaK Drops on the Long Term Evolution of the Space Debris Population", University of Pisa, 1997. ^ Gruss, Mike (2015-05-06). "DMSP-F13 Debris To Stay On Orbit for Decades". Space News. Retrieved 7 May 2015. ^ In some cases they return to the ground intact, see this list for examples. ^ Loftus, Joseph P. (1989). Orbital Debris from Upper-stage Breakup. AIAA. p. 227. ^ Phillip Anz-Meador and Mark Matney, "An assessment of the NASA explosion fragmentation model to 1 mm characteristic sizes" Advances in Space Research, Volume 34 Issue 5 (2004), pp. 987 – 992. ^ "Debris from explosion of Chinese rocket detected by University of Chicago satellite instrument", University of Chicago press release, 10 August 2000. ^ "Rocket Explosion", Spaceweather.com, 22 February 2007. Retrieved 21 February 2007. ^ Ker Than, "Rocket Explodes Over Australia, Showers Space with Debris" Space.com, 21 February 2007. Retrieved 21 February 2007. ^ "Recent Debris Events" celestrak.com, 16 March 2007. Retrieved 14 July 2001. ^ Jeff Hecht, "Spate of rocket breakups creates new space junk", NewScientist, 17 January 2007. Retrieved 16 March 2007. ^ "Proton Launch Failure 2012 Aug 6". Zarya. 21 October 2012. Retrieved 21 October 2012. ^ a b c Note that the list Schefter was presented only identified USSR ASAT tests. ^ Clayton Chun, "Shooting Down a Star: America's Thor Program 437, Nuclear ASAT, and Copycat Killers", Maxwell AFB Base, AL: Air University Press, 1999. ISBN 1-58566-071-X. ^ a b David Wright, "Debris in Brief: Space Debris from Anti-Satellite Weapons" Union of Concerned Scientists, December 2007. ^ Leonard David, "China's Anti-Satellite Test: Worrisome Debris Cloud Circles Earth" space.com, 2 February 2007. ^ "Fengyun 1C – Orbit Data" Heavens Above. ^ Brian Burger, "NASA's Terra Satellite Moved to Avoid Chinese ASAT Debris", space.com. Retrieved 6 July 2007. ^ "Pentagon: Missile Scored Direct Hit on Satellite. ", npr.org, 21 February 2008. ^ Jim Wolf, "US satellite shootdown debris said gone from space", Reuters, 27 February 2009. ^ "Orbital Debris FAQ: How did the Mir space station fare during its 15-year stay in Earth orbit? ", NASA, July 2009. ^ Phillip Clark, "Space Debris Incidents Involving Soviet/Russian Launches", Molniya Space Consultancy, friends-partners.org. ^ Paul Marks, "Satellite collision 'more powerful than China's ASAT test", New Scientist, 13 February 2009. ^ "2 big satellites collide 500 miles over Siberia." yahoo.com, 11 February 2009. Retrieved 11 February 2009. ^ Becky Iannotta, "U.S. Satellite Destroyed in Space Collision", space.com, 11 February 2009. Retrieved 11 February 2009. ^ Leonard David. "Russian Satellite Hit by Debris from Chinese Anti-Satellite Test". space.com. ^ a b c Schefter, p. 50. ^ a b Rob Matson, "Satellite Encounters" Visual Satellite Observer's Home Page. ^ "STS-48 Space Shuttle Mission Report", NASA, NASA-CR-193060, October 1991. ^ a b Kelly, John. "Debris is Shuttle's Biggest Threat", space.com, 5 March 2005. ^ "Debris Danger." Aviation Week & Space Technology, Volume 169 Number 10 (15 September 2008), p. 18. ^ William Harwood, "Improved odds ease NASA's concerns about space debris", CBS News, 16 April 2009. ^ D. Lear et al, "Investigation of Shuttle Radiator Micro-Meteoroid & Orbital Debris Damage", Proceedings of the 50th Structures, Structural Dynamics, and Materials Conference, 4–7 May 2009, AIAA 2009–2361. ^ K Thoma et al, "New Protection Concepts for Meteoroid / Debris Shields", Proceedings of the 4th European Conference on Space Debris (ESA SP-587), 18–20 April 2005, p. 445. ^ Henry Nahra, "Effect of Micrometeoroid and Space Debris Impacts on the Space Station Freedom Solar Array Surfaces" Presented at the 1989 Spring Meeting of the Materials Research Society, 24–29 April 1989, NASA TR-102287. ^ a b c d de Selding, Peter B. (2014-01-16). "Space Station Required No Evasive Maneuvers in 2013 Despite Growing Debris Threat". Space News. Retrieved 2014-01-17. ^ "Junk alert for space station crew", BBC News, 12 March 2009. ^ "International Space Station in debris scare", BBC News, 28 June 2011. ^ Haines, Lester. "ISS spared space junk avoidance manoeuvre", The Register, 17 March 2009. ^ a b c Kessler 1991, p. 63. ^ Bechara J. Saab, "Planet Earth, Space Debris", Hypothesis Volume 7 Issue 1 (September 2009). ^ Brown, M. (2012). Orbital Debris Frequently Asked Questions. Retrieved from http://orbitaldebris.jsc.nasa.gov/faqs.html. ^ "Today in Science History" todayinsci.com. Retrieved 8 March 2006. ^ Tony Long, "Jan. 22, 1997: Heads Up, Lottie! It's Space Junk! ", wired, 22 January 2009. 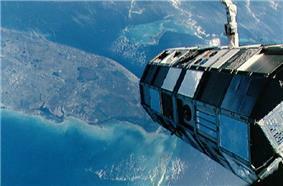 ^ "NASA – Part I – The History of Skylab." NASA's Marshall Space Flight Center and Kennedy Space Center, 16 March 2009. ^ "NASA – John F. Kennedy Space Center Story." NASA Kennedy Space Center, 16 March 2009. ^ "PAM-D Debris Falls in Saudi Arabia", The Orbital Debris Quarterly News, Volume 6 Issue 2 (April 2001). ^ Jano Gibson, "Jet's flaming space junk scare", The Sydney Morning Herald, 28 March 2007. ^ D. Mehrholz et al, "Detecting, Tracking and Imaging Space Debris", ESA bulletin 109, February 2002. ^ Pantaleo, Rick. 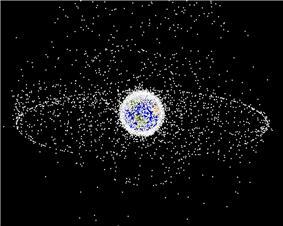 "Australian Scientists Track Space Junk by Listening to FM Radio". web. Retrieved 3 December 2013. ^ Grant Stokes et al, "The Space-Based Visible Program", MIT Lincoln Laboratory. Retrieved 8 March 2006. ^ H. Klinkrad, "Monitoring Space – Efforts Made by European Countries", fas.org. Retrieved 8 March 2006. ^ "MIT Haystack Observatory" haystack.mit.edu. Retrieved 8 March 2006. ^ "AN/FPS-108 COBRA DANE." fas.org. Retrieved 8 March 2006. ^ Darius Nikanpour, "Space Debris Mitigation Technologies", Proceedings of the Space Debris Congress, 7–9 May 2009. ^ "STS-76 Mir Environmental Effects Payload (MEEP)", NASA, March 1996. Retrieved 8 March 2011. ^ a b David Portree and Joseph Loftus. "Orbital Debris: A Chronology", NASA, 1999, p. 13. ^ David Whitlock, "History of On-Orbit Satellite Fragmentations", NASA JSC, 2004 Note: "Gabbard diagrams of the early debris cloud prior to the effects of perturbations, if the data were available, are reconstructed. These diagrams often include uncataloged as well as cataloged debris data. When used correctly, Gabbard diagrams can provide important insights into the features of the fragmentation." ^ a b Johnson, Nicholas (5 December 2011). "Space debris issues". audio file, @0:05:50-0:07:40. The Space Show. Retrieved 8 December 2011. ^ a b c Foust, Jeff (2014-11-25). "Companies Have Technologies, but Not Business Plans, for Orbital Debris Cleanup". Space News. Retrieved 2014-12-06. ^ Foust, Jeff (2014-11-24). "Industry Worries Government ‘Backsliding’ on Orbital Debris". Space News. Retrieved 2014-12-08. Despite growing concern about the threat posed by orbital debris, and language in U.S. national space policy directing government agencies to study debris cleanup technologies, many in the space community worry that the government is not doing enough to implement that policy. ^ "USA Space Debris Envinronment, Operations, and Policy Updates" (PDF). NASA. UNOOSA. Retrieved 1 October 2011. ^ Johnson, Nicholas (5 December 2011). "Space debris issues". audio file, @1:03:05-1:06:20. The Space Show. Retrieved 8 December 2011. ^ "UN Space Debris Mitigation Guidelines", UN Office for Outer Space Affairs, 2010. ^ Theresa Hitchens, "COPUOS Wades into the Next Great Space Debate", The Bulletin of the Atomic Scientists, 26 June 2008. ^ "U.S. Government Orbital Debris Mitigation Standard Practices" (PDF). United States Federal Government. Retrieved 2013-11-28. ^ "Orbital Debris – Important Reference Documents. ", NASA Orbital Debris Program Office. ^ "Mitigating space debris generation". European Space Agency. 19 Apr 2013. Retrieved 27 Jul 2014. ^ E A Taylor and J R Davey, "Implementation of debris mitigation using International Organization for Standardization (ISO) standards", Proceedings of the Institution of Mechanical Engineers: G, Volume 221 Number 8 (1 June 2007), pp. 987 – 996. ^ a b "OneWeb Taps Airbus To Build 900 Internet Smallsats". SpaceNews. 2015-06-15. Retrieved 19 June 2015. ^ a b Frank Zegler and Bernard Kutter, "Evolving to a Depot-Based Space Transportation Architecture", AIAA SPACE 2010 Conference & Exposition, 30 August-2 September 2010, AIAA 2010–8638. ^ Luc Moliner, "Spot-1 Earth Observation Satellite Deorbitation", AIAA, 2002. 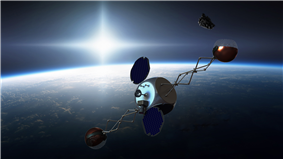 ^ Bill Christensen, "The Terminator Tether Aims to Clean Up Low Earth Orbit", space.com. Retrieved 8 March 2006. ^ a b c Stefan Lovgren, "Space Junk Cleanup Needed, NASA Experts Warn." National Geographic News, 19 January 2006. ^ Jonathan Amos, "How satellites could 'sail' home", BBC News, 3 May 2009. ^ "Safe And Efficient De-Orbit Of Space Junk Without Making The Problem Worse". Space Daily. 2010-08-03. Retrieved 2013-09-16. ^ Erika Carlson et al, "Final design of a space debris removal system", NASA/CR-189976, 1990. ^ "Intelsat Picks MacDonald, Dettwiler and Associates Ltd. for Satellite Servicing", CNW Newswire, 15 March 2011. Retrieved 15 July 2011. ^ Peter de Selding, "MDA Designing In-orbit Servicing Spacecraft", Space News, 3 March 2010. Retrieved 15 July 2011. ^ Schaub, H., Sternovsky, Z., (2013). "Active Space Debris Charging for Contactless Electrostatic Disposal". Advances in Space Research. 53(1), 110-118. http://dx.doi.org.esf.idm.oclc.org/10.1016/j.asr.2013.10.003. ^ Jonathan Campbell, "Using Lasers in Space: Laser Orbital Debris Removal and Asteroid Deflection", Occasional Paper No. 20, Air University, Maxwell Air Force Base, December 2000. ^ Mann, Adam (26 October 2011). "Space Junk Crisis: Time to Bring in the Lasers". Wired Science. Retrieved 1 November 2011. ^ Ivan Bekey, "Project Orion: Orbital Debris Removal Using Ground-Based Sensors and Lasers. ", Second European Conference on Space Debris, 1997, ESA-SP 393, p. 699. ^ Justin Mullins "A clean sweep: NASA plans to carry out a spot of housework. ", New Scientist, 16 August 2000. ^ Tony Reichhardt, "Satellite Smashers", Air & Space Magazine, 1 March 2008. 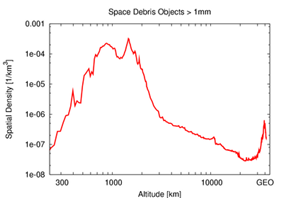 ^ James Mason et al, "Orbital Debris-Debris Collision Avoidance", arXiv:1103.1690v2, 9 March 2011. ^ Daniel Michaels, "A Cosmic Question: How to Get Rid Of All That Orbiting Space Junk? ", Wall Street Journal, 11 March 2009. ^ "Company floats giant balloon concept as solution to space mess", Global Aerospace Corp press release, 4 August 2010. ^ "Space Debris Removal", Star-tech-inc.com. Retrieved 18 July 2011. ^ Foust, Jeff (5 October 2011). "A Sticky Solution for Grabbing Objects in Space". MIT Technology Review. Retrieved 7 October 2011. ^ "News", Star Inc. Retrieved 18 July 2011. 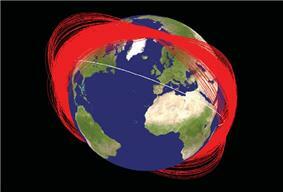 ^ "Cleaning up Earth's orbit: A Swiss satellite tackles space junk". EPFL. 15 February 2012. Retrieved 2013-04-03. ^ Jan, McHarg (10 August 2012). "Project aims to remove space debris". Phys.org. Retrieved 2013-04-03. 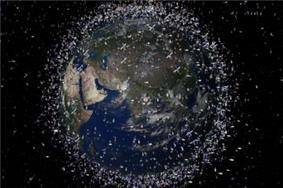 ^ "Experts: Active Removal Key To Countering Space Junk Threat" Peter B. de Selding, Space.com 31 October 2012. ^ Fred Whipple, "The Theory of Micro-Meteorites, Part I: In an Isothermal Atmosphere", Proceedings of the National Academy of Sciences, Volume 36 Number 12 (15 December 1950), pp. 667 – 695. ^ Fred Whipple, "The Theory of Micrometeorites. ", Popular Astronomy, Volume 57, 1949, p. 517. ^ a b Whipple, Fred. "A Comet Model. II. Physical Relations for Comets and Meteors", Astrophysical Journal, Volume 113 (1951), pp. 464–474. ^ D. E. Brownlee, D. A. Tomandl and E. Olszewski. "1977LPI.....8..145B Interplanetary dust: A new source of extraterrestrial material for laboratory studies", Proceedings of the 8th Lunar Scientific Conference, 1977, pp. 149–160. ^ Hans Pettersson, "Cosmic Spherules and Meteoritic Dust." Scientific American, Volume 202 Issue 2 (February 1960), pp. 123–132. ^ Andrew Snelling and David Rush, "Moon Dust and the Age of the Solar System" Creation Ex-Nihilo Technical Journal, Volume 7 Number 1 (1993), p. 2–42. ^ Brian Marsden, "Professor Fred Whipple: Astronomer who developed the idea that comets are 'dirty snowballs'." The Independent, 13 November 2004. ^ Fred Whipple, "Of Comets and Meteors" Science, Volume 289 Number 5480 (4 August 2000), p. 728. ^ Judith Reustle (curator), "Shield Development: Basic Concepts", NASA HVIT. Retrieved 20 July 2011. ^ Kim Dismukes (curator), "TransHab Concept", NASA, 27 June 2003. Retrieved 10 June 2007. ^ Howell, Elizabeth (2014-10-06). "Private Inflatable Room Launching to Space Station Next Year". Space.com. Retrieved 2014-12-06. ^ Donald Kessler, "Upper Limit on the Spatial Density of Asteroidal Debris" AIAA Journal, Volume 6 Number 12 (December 1968), p. 2450. ^ Ernst Öpik, "Collision probabilities with the planets and the distribution of interplanetary matter", Proceedings of the Royal Irish Academy of Sciences, Volume 54A (1951), pp. 165 – 199. ^ Donald Kessler, "Derivation of the Collision Probability between Orbiting Objects: The Lifetimes of Jupiter's Outer Moons", Icarus, Volume 48 (1981), pp. 39 – 48. ^ Felix Hoots, Paul Schumacher Jr. and Robert Glover, "History of Analytical Orbit Modeling in the U.S. Space Surveillance System." Journal of Guidance Control and Dynamics, Volume 27 Issue 2, pp. 174 – 185. ^ See charts, Hoffman p. 7. ^ See chart, Hoffman p. 4. ^ In the time between writing Chapter 1 (earlier) and the Prolog (later) of Space Debris, Klinkrad changed the number from 8,500 to 13,000 – compare p. 6 and ix. ^ Michael Hoffman, "It's getting crowded up there." Space News, 3 April 2009. ^ "Space Junk Threat Will Grow for Astronauts and Satellites", Fox News, 6 April 2011. ^ Antony Milne, Sky Static: The Space Debris Crisis, Greenwood Publishing Group, 2002, ISBN 0-275-97749-8, p. 86. ^ Paul Marks, "Space debris threat to future launches", 27 October 2009. Donald Kessler (Kessler 1991), "Collisional Cascading: The Limits of Population Growth in Low Earth Orbit", Advances in Space Research, Volume 11 Number 12 (December 1991), pp. 63 – 66. Donald Kessler (Kessler 1971), "Estimate of Particle Densities and Collision Danger for Spacecraft Moving Through the Asteroid Belt", Physical Studies of Minor Planets, NASA SP-267, 1971, pp. 595 – 605. Bibcode 1971NASSP.267..595K. Donald Kessler (Kessler 2009), "The Kessler Syndrome" webpages.charter.net, 8 March 2009. Donald Kessler (Kessler 1981), "Sources of Orbital Debris and the Projected Environment for Future Spacecraft", Journal of Spacecraft, Volume 16 Number 4 (July–August 1981), pp. 357 – 360. Donald Kessler and Burton Cour-Palais (Kessler 1978), "Collision Frequency of Artificial Satellites: The Creation of a Debris Belt" Journal of Geophysical Research, Volume 81, Number A6 (1 June 1978), pp. 2637–2646. Donald Kessler and Phillip Anz-Meador, "Critical Number of Spacecraft in Low Earth Orbit: Using Fragmentation Data to Evaluate the Stability of the Orbital Debris Environment", Presented and the Third European Conference on Space Debris, March 2001. Heiner Klinkrad, "Space Debris: Models and Risk Analysis", Springer-Praxis, 2006, ISBN 3-540-25448-X. (Technical), "Orbital Debris: A Technical Assessment" National Academy of Sciences, 1995. ISBN 0-309-05125-8. Jim Schefter, "The Growing Peril of Space Debris" Popular Science, July 1982, pp. 48 – 51. Steven A. Hildreth and Allison Arnold. Threats to U.S. National Security Interests in Space: Orbital Debris Mitigation and Removal. Washington, D.C.: Congressional Research Service, 8 January 2014. David Leonard, "The Clutter Above", Bulletin of the Atomic Scientists, July/August 2005. Patrick McDaniel, "A Methodology for Estimating the Uncertainty in the Predicted Annual Risk to Orbiting Spacecraft from Current or Predicted Space Debris Population". National Defense University, 1997. "Interagency Report on Orbital Debris, 1995", National Science and Technology Council, November 1995. Nickolay Smirnov, Space Debris: Hazard Evaluation and Mitigation. Boca Raton, FL: CRC Press, 2002, ISBN 0-415-27907-0. Richard Talcott, "How We Junked Up Outer Space", Astronomy, Volume 36, Issue 6 (June 2008), pp. 40–43. "Technical report on space debris, 1999", United Nations, 2006. ISBN 92-1-100813-1. Robin Biesbroek (2015). Active Debris Removal in Space: How to Clean the Earth's Environment from Space Debris. CreateSpace.